An Alaska steeppass and false weir were used to attract fish into the system. A team of researchers from the Pacific Northwest National Laboratory performed an evaluation of a novel technology that helps migratory fish more safely and efficiently navigate upstream around hydroelectric dams. The team found that the technology—a combination of imaging and sensor technology and transport tubes—has the potential to successfully sort and transport migratory adult salmonids when partnered with a way for fish to enter on their own. The study also determined the fish passage rate could approach 100 percent, once fish enter. And that means dam operators could have a fish-friendlier and more flexible option for passage beyond construction of costlier traditional fishways with high cost-associated operations and maintenance programs. The results of the research team’s evaluation were recently published in the manuscript, “ Evaluation of Passage and Sorting of Adult Pacific Salmonids through a Novel Fish Passage Technology,” in Fisheries Research. Hydropower harnesses the power of entire rivers and other bodies of water to provide clean, inexpensive electricity to millions of consumers. Nearly every state uses hydropower to supply a portion of its electricity; as an example, 74 percent of Washington State’s electricity is generated by this renewable energy source thanks to the state’s abundant waterways. But hydropower dams and permanent fishways can serve as barriers that inhibit fish migration and habitat connectivity—especially if river flows and temperatures have changed since dam or fishway construction, or if silt builds up, decreasing their effectiveness and capacity. 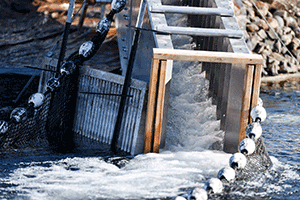 Typical fish passage technologies—such as fish ladders—can accommodate several species of fish of a limited range of sizes, but the performance of those technologies in attracting fish and allowing them to pass through efficiently varies considerably. Migratory delays of fish passing through the dams can tax the energy of the fish, impacting their survival and ability to reproduce. And active passage methods, such as trap-and-haul, can cause stress and mortality in fish because they are directly handled and undergo delay and containment. 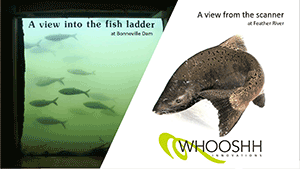 To help overcome these challenges, the PNNL team conducted an evaluation of one alternative to typical fish passage technology—the Whooshh Fish Transport System, or WFTS. The WFTS is designed to move fish around barriers through a flexible tube using differential air pressure. Its adaptability allows it to be deployed at sites where traditional methods aren’t possible due to large variations in tailrace or forebay, accessibility, or cost. The team’s objectives—to evaluate the feasibility of a combination of systems to transport adult Chinook salmon and steelhead and sort them into two group sizes, while also assessing the physical effects on the fish as they passed through the system. Representation of fish image as fish goes through the scanning sorting system (right), versus image of fish using existing imaging techniques. Image courtesy of Whooshh. The team evaluated a version of the WFTS that used an Alaska steeppass and false weir to attract fish into the system. The steeppass-weir combination allowed for a way for fish to swim to the WFTS entrance so they lined up to enter the system in single file—allowing optimal system use. The team operated the system in combination with the Whooshh scanning sorting system equipped with cameras and sensors. The evaluation was conducted using adult fall Chinook salmon and steelhead returning to the hatchery—the Ringold Springs Rearing Facility—located on the eastern shore of the Columbia River. Beginning in a collection pool, the fish entered the steeppass, swimming up and over the false weir. As they slid through the scanning sorting system, the cameras captured multiple images of each fish, which were computationally processed to enable real-time sorting decisions so that individual fish were immediately routed to the transport tube (larger fish) or the bypass (smaller fish). If fish were too close together in the scanning sorting system or inadequate images were captured, the control system defaulted those fish to the bypass. Those that were routed to the transport tube were then pushed by differential air pressure through the tube to an exit pool about 100 feet away, where they were examined. Total passage time from the false weir through the transport tube ranged from 4 to 8 seconds. A total of 367 Chinook salmon and 85 steelhead passed through the system during the evaluation. It showed that fish were successfully transported through the system and any external injuries observed were minor and at a rate lower than for a control group. The number of unexpected events (e.g., backwards transport) experienced by both species were low and had no impact on the condition of the fish. This demonstrates the system’s ability to successfully sort and transport migratory adult salmonids around in-stream barriers like dams. The team also found that the girth and length of the transported fish were significantly larger than the fish that bypassed the system—suggesting that the system correctly sized fish and routed them appropriately. This study contributes to the understanding of the performance of the Whooshh system by simulating a full-scale deployment. The next step will be to evaluate the WFTS at a hydropower dam. This study was funded by DOE’s Water Power Technologies Office through its Small Business Voucher Program.